The Whileaways: Noelie McDonnell, Nicola Joyce, and Noriana Kennedy. 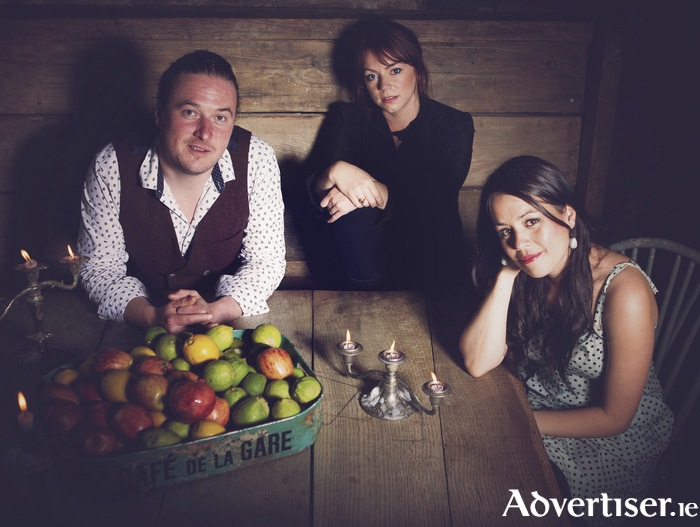 ACCLAIMED GALWAY folk/Americana trio The Whileaways, whose new album Saltwater Kisses is the RTÉ Radio 1 Album of the Week, will play in the Kai Café + Restaurant, Sea Road. The show takes place on Tuesday November 10 and the band, which consists of singer-songwriters Noriana Kennedy, Nicola Joyce, and Noelie McDonnell, will perform music from Saltwater Kisses and their 2012 self titled debut. Noriana, Nicola, and Noelie are all accomplished and respected vocalists and songwriters who solo, or with bands like Gradá, The Cabin Collective, and Nábac, have six albums to their collective credit. Noriana’s solo album, Ebb'n'Flow, received rave reviews in Ireland and in Australia, where she was acknowledged as "an exceptional young artist with a rare ability" (ABC Australia ). Nicola Joyce, "a magnificent vocalist who sings with sheer beauty and poignancy” (The Wall St Journal ), recorded and toured as the lead singer with Gráda and working with folk stalwart and Grammy winner Tim O'Brien. Noelie McDonnell, "a startlingly good Irish talent" (New York Post ), spent two months in the iTunes Top 10 folk album charts and has released three solo albums. Collectively as The Whileaways, the trio have also enjoyed critical and public acclaim. Their self-titled debut album was described by The Irish Times as "an audacious debut (which hollers for a chance to be heard in a live setting, so rich is its lyrical tapestry ) from musicians whose experience pays ample dividends here". Tickets are €55 per head and include a three-course meal, welcome drink, and The Whileaways gig. See kaicaferestaurant.com www.thewhileawaysmusic.com.